The video of Greig Tonkins punching a kangaroo who had his dog in a chokehold went viral on Monday, but it’s not simply one of a man saving his dog. It’s a small vignette of a much longer and meaningful video made to document and honour a dying man’s last wish. The video depicting Tonkins’ encounter with a kangaroo was originally shot in June when Tonkins and a group of friends went on a wild board hunting trip in New South Wales, Australia. The trip was meant for 19-year-old Kailem Barwick, suffering from Ewing Sarcoma, a rare form of bone cancer, and whose dying wish was to hunt a wild boar. Matthew Amor, a friend of Barwick, organised the trip of which more than hours’ worth footage was captured and compiled in a DVD meant for Barwick’s friends and family. Barwick was diagnosed in 2014 and was cancer-free after undergoing treatments. But then, in January 2016, the cancer relapsed. After undergoing surgery in February that removed three ribs and a part of his lung, his condition failed to improve. Bedridden, and facing scans showing his cancer progressing, he and his girlfriend got engaged on Nov. 16, and married on Nov. 27. Barwick passed away on Dec. 1. A GoFundMe page asking for donations to help cover Barwick’s medical costs has been set up. It also shows the couple’s wedding video. The DVD of the hunting trip has since been released to newsagents, said Amor to New.com.au . “Kailem would be looking down from [heaven] and laughing because it was the highlight of the trip,” Amor said. 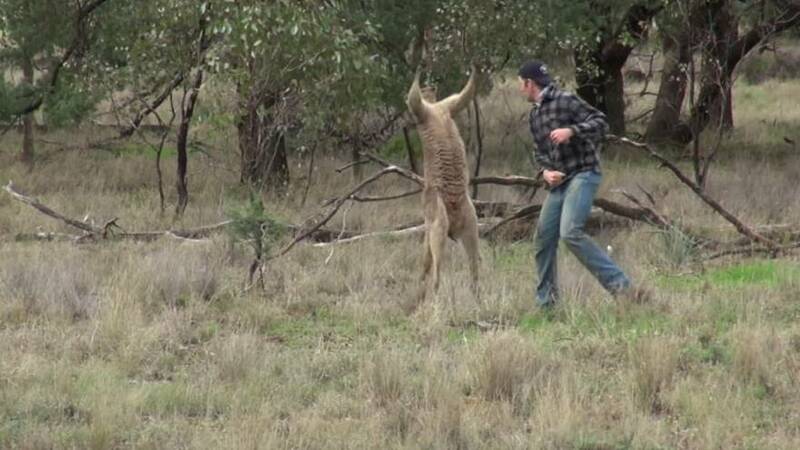 Some animal rights activists, however, called for Tonkins, a zoo worker, to be sacked for punching the kangaroo. Taronga Western Plains Zoo, where Tonkins works, says there is no suggestion Tonkins would lose his job over the incident. Is it too late to write in Kangaroo Puncher for President? I don't think he needed to punch the Kangaroo in the face! Although many of these comments online were positive, activists from both the Humane Society International Australia and People for the Ethical Treatment of Animals (PETA) suggested that Tonkins should be sacked from his role as elephant keeper. PETA coordinator Claire Fryer went as far to suggest Tonkins should be prosecuted for his actions, in comments made to APN. Has PETA jumped on that guy for punching that kangaroo??? Do they know that the Roo started it??? Taronga Zoo said it “strongly opposes the striking of animals”, and supports government guidelines on what actions people should take “in the event of confrontation with a kangaroo”. The New South Wales Office of Environment & Heritage guidelines say people should “not allow your dog to approach a kangaroo. Kangaroos will vigorously defend themselves against dogs, and this may draw you into a dangerous situation”. In a threatening situation, the Office say people should “move well clear” of an aggressive kangaroo, and “Try not to attract the kangaroo’s attention” while keeping “your head and arms low”.